Weeks ago, a few before the marathon, I decided that I wanted to race the Bread and Honey 15K on June 8th. I love its atmosphere and 15K is one of my favorite distances. The time frame gave me more than a month to recover from the marathon so everything about it seemed right. The problem I had was to figure out which path I wanted to follow after the Bread and Honey. 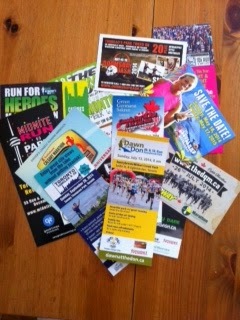 One difficulty that I’m facing is there is sooooo much to chose from; these are just a handful of flyers that I got in a recent race kit. I considered road racing as well as track and trail; I did not look at any of the more “extreme” races like Spartan Race, Colour Me Rad, or Slime Run. To me, those are more opportunities to run and be silly; I want a good old-fashioned “run until you puke or die” kind of race. I looked at race series like Subaru, Canada Running Series and Excel Racing, and I quickly checked off anything that was downhill. I thought about location – close to home is always better – and I worried about how Little Ironman would handle my taking off early on a few Sunday mornings. So then I started to look at races that had Fun Runs for Kids. Now, a week later, I think I have finally set some summer running goals, starting with the Bread and Honey 15K. Then, I’ll race The Pride Run at the end of June, which will be a challenging race with many younger and stronger runners, likely followed by the Ontario Masters 10K at Varsity Stadium the next day. The Masters Track races is taking me outside my comfort zone and, so, has become my summer goal: race track. Before I fully commit to that, though, I need to spend more time on the track in the next few weeks and wrap my head around the idea of racing 40 laps. Assuming that everything goes well, I’ll add the Canadian Masters 5K at Varsity Stadium in July. And I’m quite sure that I’ll find something to do after that; trail racing is on my mind, and I’m sure I’ll find another road race or too. The other goal I have set is to spend more time at the yoga studio. I stopped in the winter as timing never seemed to work out; either I had a long run the next day or I just couldn’t get away from work or family in time to get to a class. After finally getting to one last night, I realize how much I should have made that extra effort as my legs and core are tighter than tight. On a more positive note, I had no trouble keeping up with the abdominal work at my first class back; in fact, I could push through to the end when others couldn’t. A handstand? Well, that’s a different story. So goals are set and everything seems to be moving forward. Now it’s just time to chase some new dreams.